Exporter of a wide range of products which include burnt look handmade papers and old, antique, aged handmade paper for calligrahy artists. We manufacture a large range of custom made, old look, deckle edged handmade papers . 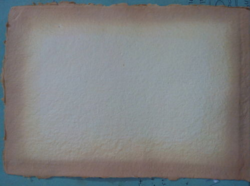 Old look, aged handmade papers ideal for calligraphy artisans. Burnt Look Handmade Papers in various sizes for Calligraphy. Burnt Look Handmade Papers with Deckle Edges for Calligraphy Artists. 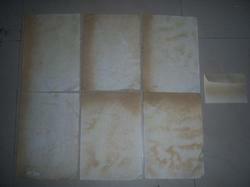 We manufacture a large range of Burnt/ Old Look Handmade Papers. Our Calligraphy Papers are also available with Burnt Look Edges. Our Acid Free Old Look Papers for Calligraphy are quite popular with Artisans around the world. Our Old Look Handmade Paper with Burnt Edges are suitable for doing calligraphy on scroll invites. We are also Supplying Old Look Calligraphy handmade Papers with Burnt Edges suitable for making Greeting Cards. Our Old Look Paper is available with Burnt Edges for Calligraphy. Our Range of Old Look Papers is very popular with Calligraphy Artists.We manufacture a large range of Handmade Paper suitable for Calligraphy. Our Calligraphy papers are available in Banana, Silk , Lokta and Cotton Rag Qualities. Our Calligraphy papers are available in a large number of sizes. Looking for Antique Look Handmade Paper ?